With so many great gifts to choose from, it can be difficult to make the final choice. After all, each one looks and feels just as cool as the others so that you will be tempted to just buy everything and be done with it. Well, it is your call so go ahead and do so. Did you know, however, that there are many ways to make cool presents for kids even better? Yes, you can buy ready-made gifts from online stores and then tweak these things to make your very own homemade presents! Here are a few tricks. Adding other fun tools like scissors, cookie cutters, rolling pin, and even toy plates, forks and spoons to the gift. Mixing non-toxic scented substances like scented drink mixes or vanilla extract to make the play dough more interesting. Adding glitters, sparkles and other shiny things for a 3D effect on the play dough, thus, turning a ho-hum gift into one of the most memorably cool gifts. Here is a great recipe for the best play dough. Who said that cool presents for kids have to be expensive? With play dough as homemade presents, you can make great gifts with minimal effort on your part. 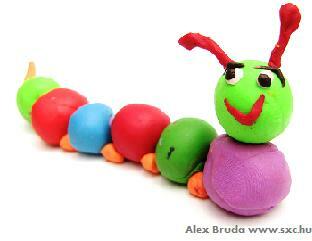 Trace your child’s drawings on the fabric using a fabric marker. Scan the drawings, edit using Photoshop to make black-and-white patterns and print on paper (If you don't have Photoshop you can scan it, re-size (if needed) and print in black-and-white). Trace the outlines on the fabric and your great gift is done. I got this adorable idea from Jennifer as I ran into her blog post. 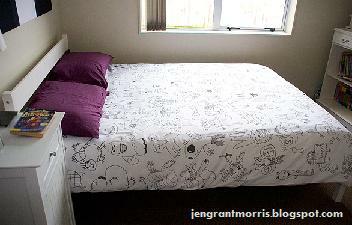 Here is how Jennifer made a duvet cover from her son's sketches . Thank you Jennifer! Use iron-on heat transfers to make the patterns stick on the fabric. The process is similar to tracing on fabric except that you print the sketches on iron-on heat transfer paper and iron the paper to the fabric. Send the bedding to be personalized as well as the patterns or the photos (of the kid, family or favorite pet) to be printed to an online site specializing in the service . Embroider the bedding for your personalized touch and voila! You have one of the best homemade presents, not to mention one of best presents ever. Tip - Use plain beddings with solid colors that will complement the prints. Can you imagine the smile on your child's face when he goes to sleep covered with personalized bedding made especially for him? Make the hooded towels on your own. The steps in this instructional video for one of the best homemade presents are easy to follow - starting with making the hood and its accessories and ending with attaching the finishing details on the towels. Buy the hooded towels from an online site. You can then embroider the recipient’s initials or name for your personalized touch. So, which one of these cool presents for kids will you make? Well, just make everything of these homemade gifts and make your kids happy.